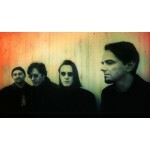 Porcupine Tree is a progressive rock band formed by Steven Wilson in 1987 in Hemel Hempstead, England. Their music is difficult to categorise, being associated with both psychedelic rock and progressive rock, yet having been influenced by trance, krautrock and ambient due to Steven Wilson and Richard Barbieri's penchant for the Kosmische Musik scene of the early 1970s, led by bands such as Tangerine Dream, Neu! and Can.Since the early 2000s, their music has been leaning towards progressive metal and alternative rock. The band are noted for their multimedia approach, with their live performances including screens displaying a different film projection to each song. This visual element was introduced during the tour for the In Absentia album, when the band started to work with Danish photographer and filmmaker Lasse Hoile. This involvement created a distinctive image for the band. Despite being signed to both Roadrunner and Atlantic labels,the band has their own record label, Transmission, which they use to launch some independent releases and special editions of their albums. In 2007 the band was nominated for a Grammy Award for Best Surround Sound Album with their album Fear of a Blank Planet and then again in 2010 with The Incident.